When you forge bonds at work, travel together, respectively meet families, then you have succeed in one of life’s finest accomplishments. So how might we celebrate this friendship? Invite them to dine. Such was the opportunity when My Hunney and I were lucky enough to have Stori and Fred to our home. What to serve? How might we rejoice in their company. Stori and Fred are famous red wine drinkers. When neon green margarita’s flow from silver fountains at a TexMex mecca, Fred and Stori hold wine stems with inky red. So clearly we were going to dig into the cellar for a treasure. And the menu followed suite. After a tussle over Osso Bucco vs Carnitas, my Hunney and I settled on a roast tender. Fine Cooking magazine’s front cover provided inspiration. 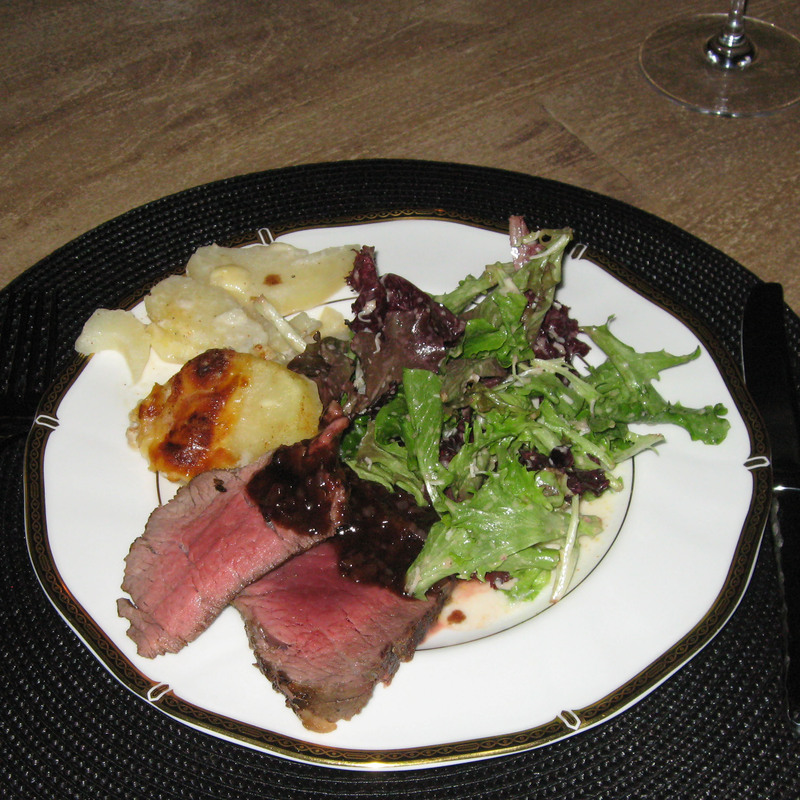 A generously spiced beef tenderloin with a red wine sauce. At that point, tacit knowledge and restless imagination took over. With empty cloth sacks over the shoulder, I inhaled the possibilities at Central Market. The inspiring picture showed an old favorite flavor duo: roast fennel bulb scented with orange. However culinary invention gnawed for something new. To secretly tickle their palate with something effusive. Familiar steak, hearty and butter soft. Yes. But the starch had to be perfumed with an exotic…”what is that” kind of spice. It had to match the mood. Celebration of company. Warm and tender friendships. And something one level up. Like the gifts of the magi, we needed a royal moment. And so scalloped potatoes were poached with cardamom before the oven. If you are not familiar with this Indian spice, its the heady perfume that sends curry from the realm of earthly pleasures into a full mind body experience. It’s an unmistakable aroma and a comforting, homey flavor even in stone cold dishes. Our favorite Indian restaurant in Houston, Indika, in Houston makes short cookies with the fabled cardamom. We’d race to Anita Jaisinghani’s place just for the complementary cookies. But that’s another story (no pun here). So onto the menu. The beef was seared in a restaurant sized pan. A health amount of seasoning of salt, pepper and freshly crushed fennel seeds smashed into every face of the meat. That found a final resting temperature of 135 degrees, or about medium rare. The potatoes were poached in milk with cardamom pods. Once cooled and stacked into a pyrex, an ample amount of Irish cheddar was layered on top. Nothing special…it was the pantry item for cheese this day. High heat near the oven coils ensured crusty brown. Lamb demiglace, butter, red wine wove together a deep sauce. The salad acts as the down notes for this song. Nothing wrong with down notes. They make the up notes up. Everything was going on the same plate, so the veggie flavor had to dance with others. The salad was purposefully simple filled with baby greens and my own signature vinegarette. It’s one that fell into my history when chance led to invention. The typical secret ingredient to ensure an emulsificaiton for dressing is honey. It doesn’t take much to trap those fat molecules and round out the tartness of vinegar. That fateful night when honey was not to be found, spiced apple syrup was. It had been six months since we visited with Stori and Fred. A few wine trips found their way in between too. A dash of Napa. A shake of Sonoma. We warmed up with a glass of white wine like some olympic swimmer shaking limbs before a freestyle. We even called that pre-dinner cocktail the “white-wine-warm up”. I suppose it was silly excuse to enjoy the guilty pleasure of wine from the wrong side of the tracks. Nothing more than a precursor to the REAL wine. They are serious red people, puh-lease! First up came Sojourn Cellar’s 2009 Pinot Noir. The vintner bottles all his wines accoring to growing region. That kept us busy while dinner transformed from ingredients to full meal. At the table we swam through the 2008 Kelham Vineyard’s merlot. Not quite as I remember tasting at the vineyard. Still quite the palate symphony with the meal. Onto the final bottle. Bryan Page has been bottling magic for years and the last of his 2002 namesake, a bordeax style blend hit our glasses mid meal. This blossomed with every note in full harmony with flavors on the table. In between the bites the air filled with laughter and retold stories. We are grateful for their friendship and for sharing more than a meal with us.